Fall is in the air which brings out the sweaters and jackets. This can be a great look for all figure types if you use layers to your advantage. 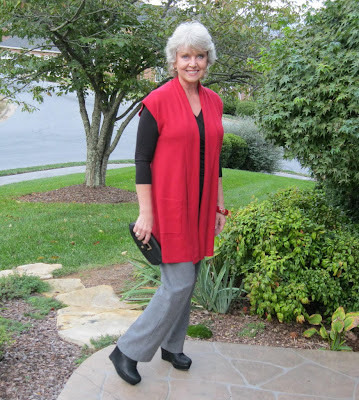 If you have long lean legs you can wear leggings or straight leg jeans with almost any type of boot. Just remember to balance the slender bottom half with a layered longer top half. Create a long slender line with one color in different tones. Add color around your face with a scarf and a long cozy sweater. If you have a few extra pounds around the middle (don't we all?!) remember to keep those first layers smooth and sleek. The sweater may have to come off as the day gets warmer so I normally wear a large scarf as well. Later in the day it will be the outer layer I drape across my shoulders when I have to take off the sweater for the afternoon. 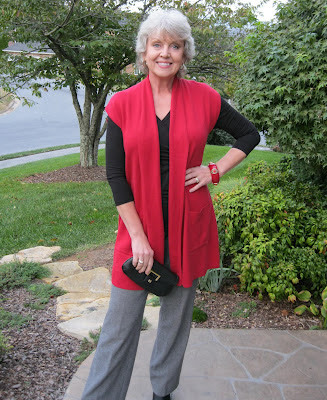 If you are petite (5' 2" and under), a cropped cardigan or jacket and tailored pants will likely work better for you. 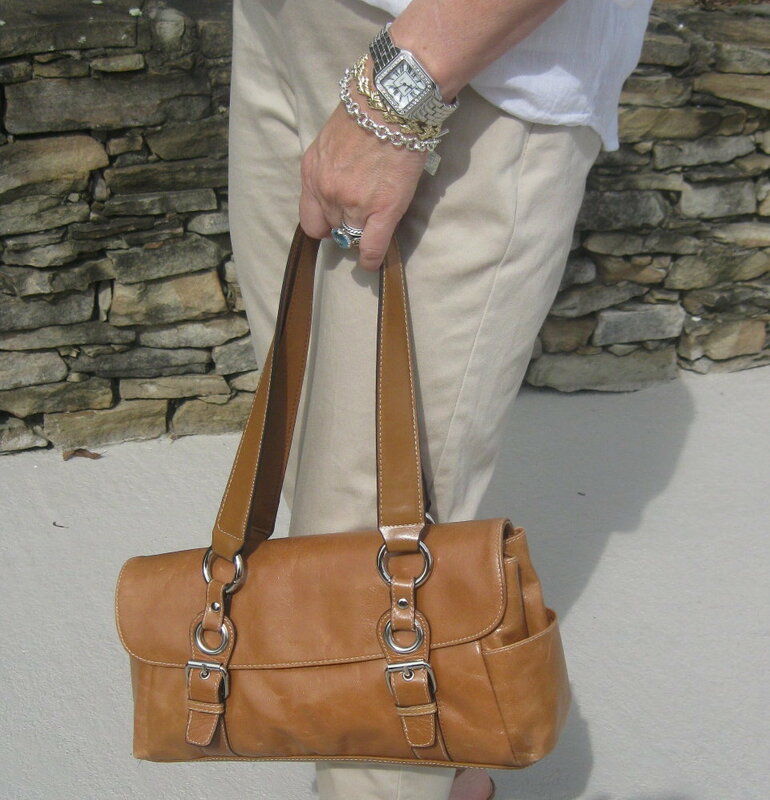 Wear a smaller silky scarf and carry a more tailored messenger bag. The best jacket or sweater for you will end at your hip bone or just below your natural waist and close in a V shape. Steer clear of double breasted closures. Enjoy this beautiful time of year and stay comfortable in layers. Mickey and I are on our way to an evening fundraiser. 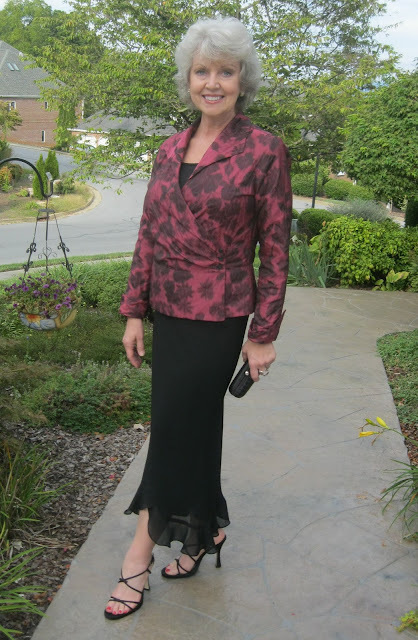 My jacket is a very light weight wrap style with a collar and I'm wearing a black tank under it. The lined black crêpe skirt is a bit shorter in the front and has a ruffle. The black satin sandals are by Sam & Libby. I normally wear only one piece of major "bling" for evening. Here I've added a dinner ring with a big pink stone mounted in antique silver. I always wear earrings because my ears are pierced but here they are very understated diamond wide half hoops. Resist the temptation to wear every shiny thing you own for evening. That makes you look much older and too cluttered. The tiny evening bag is woven black satin with a simple silver ball closure. Always switch to a small bag for evening. Thanks for all your sweet birthday wishes yesterday. I had a wonderful day! 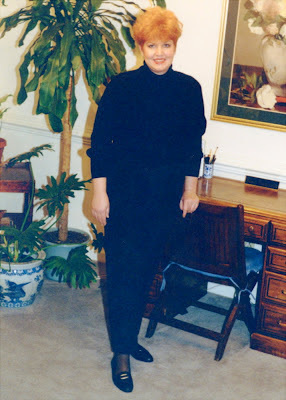 This is me in 1998 at forty-two years old, five feet seven inches tall and weighing two hundred pounds. Those pants are a size 18! My life was crumbling beneath my feet and sadness oozed from every pore. I hated my job but was too deep in debt to start over in another. My then-husband was having an affair with a much younger and more fun woman. I was grieving for the children and family I would never have. In short my life was a big mess! I cried every single day... sometimes all day long. When I hit rock bottom I decided to change everything that I had the power to change. I started to eat more fruits and vegetables and fewer heavy late in the day meals. I started walking. At first, I had a difficult time just walking to the end of the block. Soon I was walking for a couple of miles every day. The weight started to come off and I started to formulate a plan to survive this difficult time. After the marriage ended I moved to the New Orleans area. That was not the pot of gold at the end of the rainbow but it was an immensely better life than the one I left behind in Virginia. I made new friends and joined two gyms. My walks turned into five-mile runs and my time in the gym filled the huge void in my life. This photo was taken at the peak of my bodybuilding obsession. I'm forty-five in this photo and I weigh one hundred and thirty-eight pounds. I'm still an empty shell of a human but at least, I look better! 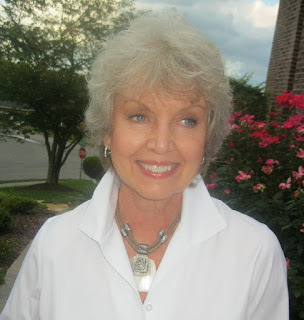 In 2003, I left New Orleans and returned to my hometown in the mountains of east Tennessee. There were still some bumpy roads ahead for me but I was home with my family and I owned a successful business. I'm telling you my life story for a reason. I hope that you will read this and say if she can do it, I can do it! If you are unhappy with some part of your life or your body, make up your mind to change it. Take little steps every day. Pretty soon you will be running (if not literally then figuratively). The mind is our most powerful tool. Think of food as the fuel it is. Don't let it be your comfort and your entertainment. If you want to be healthy and thinner, you have to make wiser choices about the foods and quantities you eat every day. The other twenty-two hours a day are worth making a few changes in the food choices you make. The photo above is a more recent photo taken just before my fifty-sixth birthday at one hundred and forty-two pounds. Those pants are a size 4! I will turn sixty later this year (2016). I have kept the weight off and I am still finding joy in my daily life. My life truly did begin at fifty. I've never been happier or more healthy than I am right now. Not that being thin is the answer to all life's problems, but when you can sleep well at night without being in pain or struggling to breathe, you can make better choices during your waking hours. Sometimes things aren't as bad as they seemed after a good night's sleep. Even though this job of fashion blogger pays next to nothing, it is very rewarding to know that my story touches the lives of other women who might be going through something similar. 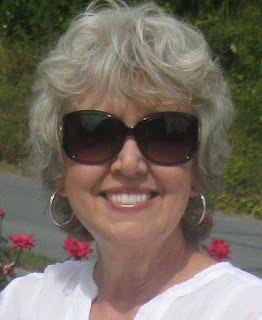 I hope that you enjoy reading my blog and visiting with me on Facebook. I share fashion tips and my personal tragedies and triumphs in the hopes that you will be inspired to make a better life for yourself also. Here's a toast to the second half of our lives! Cool Fall weather hasn't yet arrived here in east Tennessee, so I took one last advantage of the warm evening to wear a breezy summer look for Wednesday date night with Mickey. 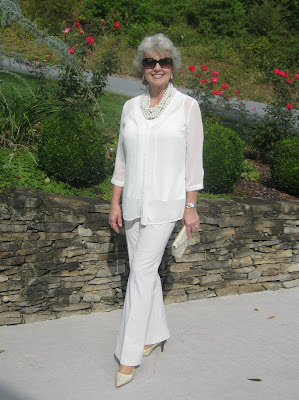 I would not normally wear heels with Capri length pants but in this case the long white tunic from Chico's paired with the khaki and white pants from Coldwater Creek almost gives the illusion of a dress. I wear a platform wedge shoe with Capri length pants in most cases. The suede booties are by Nine West. I found them at Ross for only $24! You know I had to wear them right away. 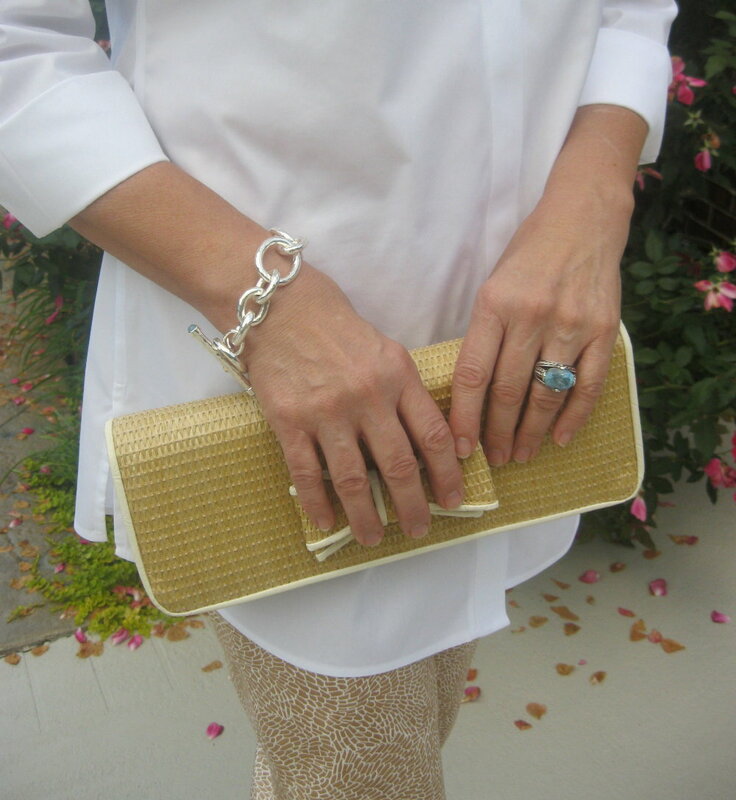 The khaki and white straw bow trimmed clutch was purchased at T.J. Maxx this year. I often wear silver or white gold jewelry because it is more flattering to my gray hair. The link bracelet and ring were purchases from my travels and are old. I'm sorry I can't remember the designers. 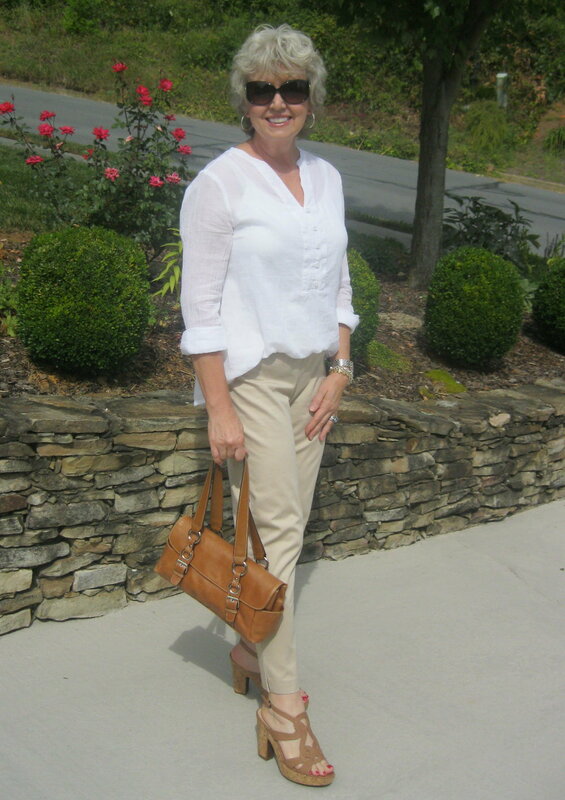 The khaki cord, shell and silver trim necklace is from Belk by Erica Lyons. Small crystal and silver hoops are also from Belk. Next week is my birthday week! Look for numerous new posts. Mickey has lots of events planned to celebrate. Hi everyone! It's September already so here in the States that means summer is starting to fade away but the afternoon is still very warm. Yesterday was consumed with preparing for a big family get to together for Labor Day. 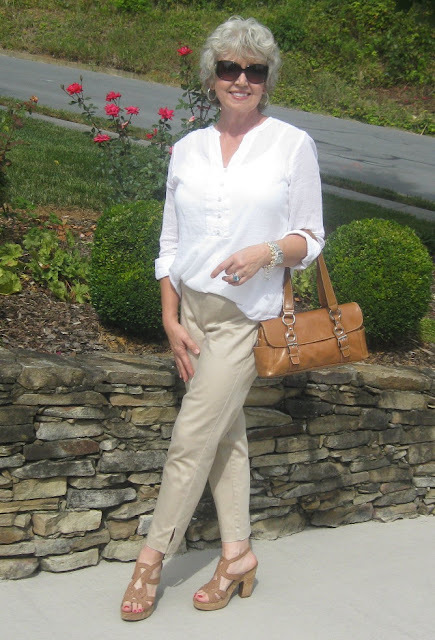 My cool and comfy daytime outfit includes khaki ankle pants and platform cork sandals both by Adrienne Vittadini from T.J. Maxx. 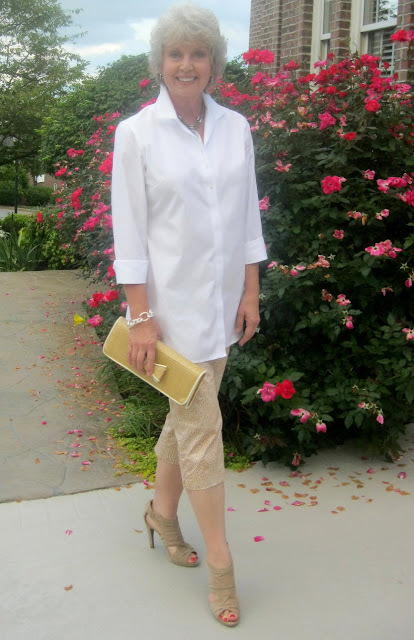 I'm wearing a white gauze Old Navy tunic over a Coldwater Creek cream tank top worn tucked in only in the front. The over-sized silver and crystal watch, sunglasses and hoop earrings are from Stein-Mart and the gold and silver link bracelets are classics I've owned for many years. The bag is from T.J. Maxx from a couple of years ago. As Mickey and I walked through the grocery store last night we passed a woman with her twenty something daughter who looked me over and said "Love your shoes!" Thanks for reading! I hope you have a great Labor Day weekend!